Well, my favorite for this year is Code Red Free. A bit dirty but really tasteful. It’s rated #4 in BPB list. 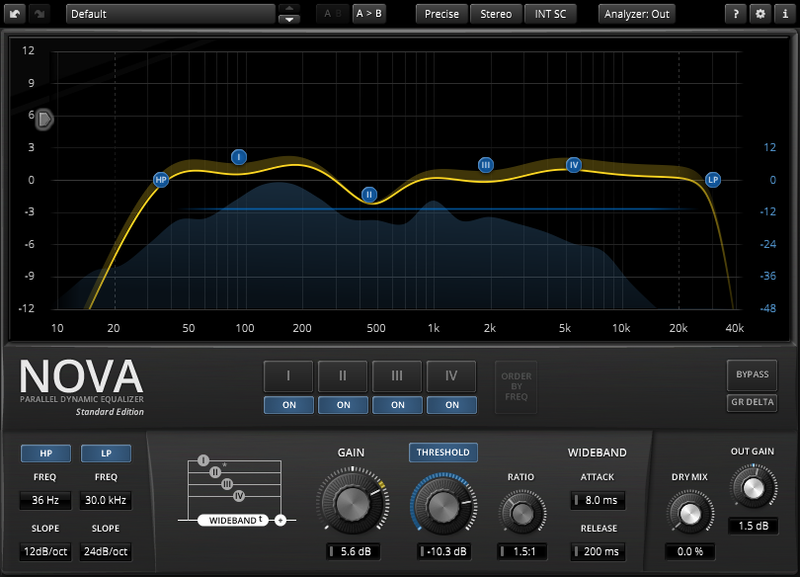 Let’s talk a bit about compressor transfer function used in TDR Nova. Well, TDR Nova 1.0.5 update was out some time ago and now it seems the plugin is somehow working. The CPU usage is higher than average but we slowly dealing with it. UI is CPU heavy too due to software rendering used but we’ll fix it in some further update. Overall sound. In “Eco” mode roughly matched original Nova 67P. Parallel filters. Mostly the same. In “Precise” mode slight non-linearity added. Frequency range extended to 10 Hz .. 40 kHz. High-pass filter. Different. Optimized for sharp curves but maintaining smoother sound at the same time (unfortunately we excluded 48 dB/Oct, 72 dB/Oct, 96 dB/Oct and 120 dB/Oct filters from freeware version). Added 6 dB/Oct HPF slope but removed 18 dB/Oct. Low-pass filter. Different. The same as high-pass. Original Nova 67P had fixed 6 dB/Oct slope only. Compressor. Different. Has smoother leveling filter, built-in gain reduction limit and hidden release automation. The compressor supports attack values down to 0.1 ms now (or even to 0.01 ms in GE version if “Insane” mode is on). Stereo implementation is 100% linked. Original Nova 67P had 50% stereo link but we changed it to 100% due to lighter CPU usage and wideness added by filters non-linearity. The main advantage of TDR Nova compressor is the ability to have different attack/release and ratio settings for each band. Also GE version supports upward expansion. Sidechain filter. Fixed to 200 Hz, 3 dB/Oct. 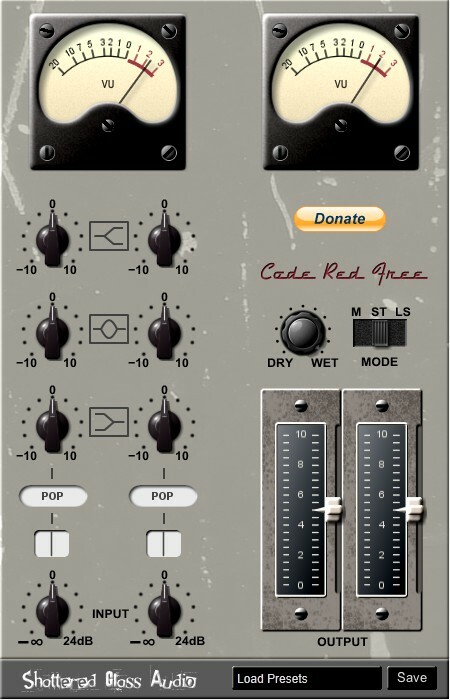 Original Nova 67P had variable sidechain filter taken from Molot. Dynamic modes. To streamline the workflow only 4 dynamic modes left: 1) the band follows wideband gain reduction (default), 2) the band doesn’t follow gain reduction (“sticky”), 3) the band has its own compressor, which uses attack/release and ratio settings from wideband compressor (“split” is off) and 4) the band has its own compressor with its own settings (“split” is on). We removed “emphasis” and “50%” modes. Analyzer. Based on 1/2 octave bandpass filters (it’s not FFT). 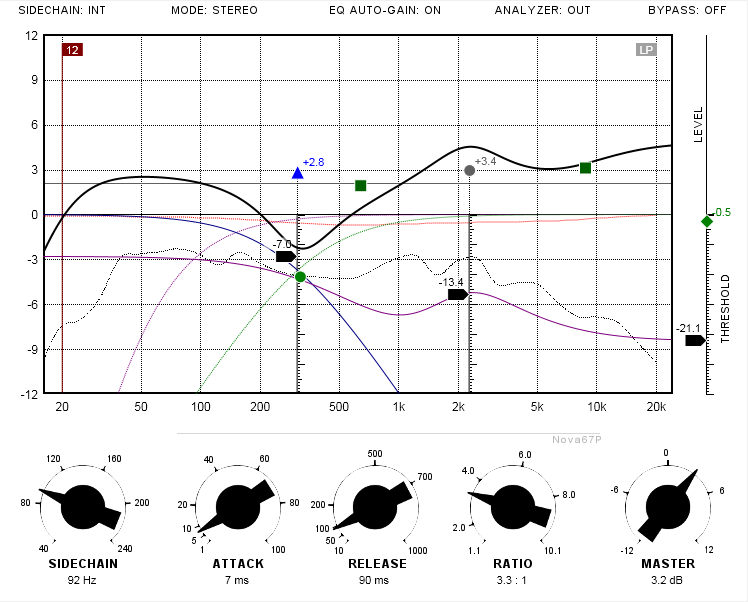 We found that such analyzer implementation provides very precise representation of dynamic aspects of the sound. Original Nova 67P had 1/3 octave bandpass filters. Stereo modes. We added mid, side, left and right modes but removed unlinked stereo mode. CPU usage (on my old Athlon 7750 bought in 2009): Original Nova 67P, “Mastering example”: 5% (plugin window is closed), 35% (plugin window is opened). 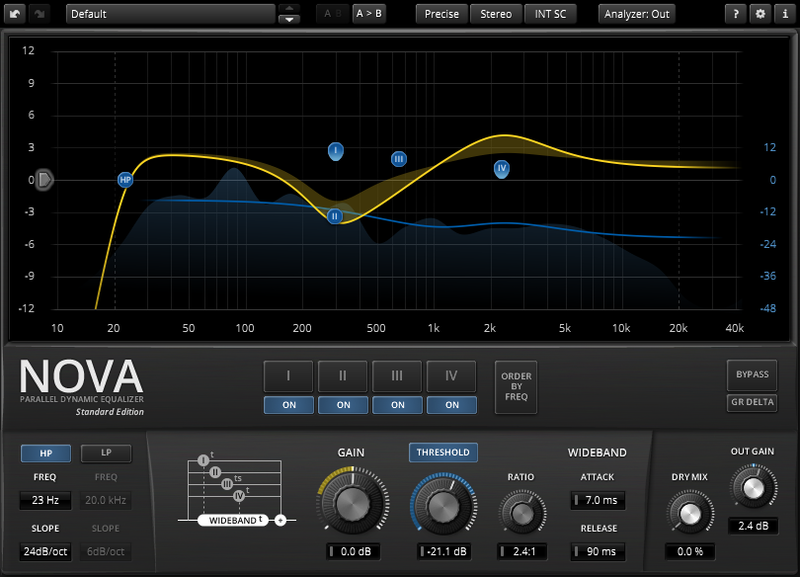 TDR Nova (“precise” mode), the same settings (see below): 14% (plugin window is closed), 25% (plugin window is opened). Original Nova 67P was planned as some kind of a channel strip but in TDR Nova we shifted the focus to mastering usage, which explains higher CPU usage and smoother sound. Both plugins use 64-bit floating point internal processing. TDR Nova has 32-bit floating point inputs/outputs due to JUCE framework specifics but this restriction doesn’t affect the audio quality and the difference lies below any reasonable audible threshold (output wav files are 32-bit floating point anyway and audio interface receives 32-bit floating point too). And finally the UI. Original Nova 67P had minimalistic “paper draft” look. While TDR Nova UI looks more 3D, we tried to keep the colors used and also the amount of curves on the display to minimum. So it’s minimalistic in some sense too.